Who does not know him? Probably the most famous retro figure in the world is the little red plumber “Super Mario”. For the first time appeared Super Mario, then still under the name “Jumpman” in the Donkey Kong game, later he developed only to what he is today. He initially started his career as a carpenter, with a bulbous nose, blue overalls and red dungarees. The design was therefore chosen because the technical conditions at that time only allowed a 16×16 pixel graphic. 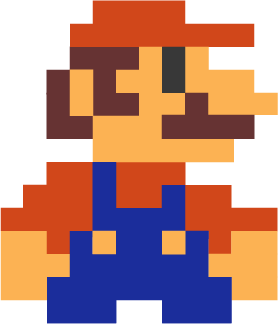 Mario became world famous in his Jump ‘n’ Run games series “Super Mario”. His job was changed into a plumber and Mario got his brother “Luigi” side by side. His overall changed over time from blue-red to red-brown and finally in red-blue. Mario’s inventor Shigeru Miyamoto made Nintendo the temporarily largest computer games company in the world. Super Mario Bros. is the first of the countless “Super Mario” games and was released on September 13, 1985 in Japan. The game was developed for the Nintendo Family Computer (Famicom) and was then also available for the Nintendo Entertainment System (NES) 2 years later. With about 40 million games sold, Super Mario Bros. has long been considered the best selling video game ever. With “Super Mario” Nintendo succeeded in entering the home console market. Various sports and board games were released and various offshoots were created, such as the “Wario” series. The “supporting actors” of the Super Mario games such as Yoshi, Luigi and Princess Pearch were also able to play the lead role with games such as “New Super Luigi U” or “Super Princess Peach”. Of course, there were also various attempts by competing companies to imitate the Mario concept. Mario was not only in games, there was even a cartoon and movies. Countless merchandising products have emerged over the years and are still enjoying great popularity.